The Institute for the Study of War (ISW) and the Critical Threats Project (CTP) at the American Enterprise Institute conducted an intensive multi-week exercise to frame, design, and evaluate potential courses of action that the United States could pursue to defeat the threat from the Islamic State in Iraq and al Sham (ISIS) and al Qaeda in Iraq and Syria. The planning group weighed the national security interests of the United States, its partners, its rivals, and its enemies operating in or influencing the conflicts in Iraq and Syria. It considered how current policies and interests are interacting in this complex environment. It identified the minimum endstates that would satisfy American national security requirements as well as the likely outcomes of current policies. The group also assessed the threat posed by al Qaeda and ISIS to the United States, both in the immediate and long term, and tested the probable outcomes of several potential courses of action that the United States could pursue in Iraq and Syria. ISW and CTP will publish the findings of this exercise in multiple reports. 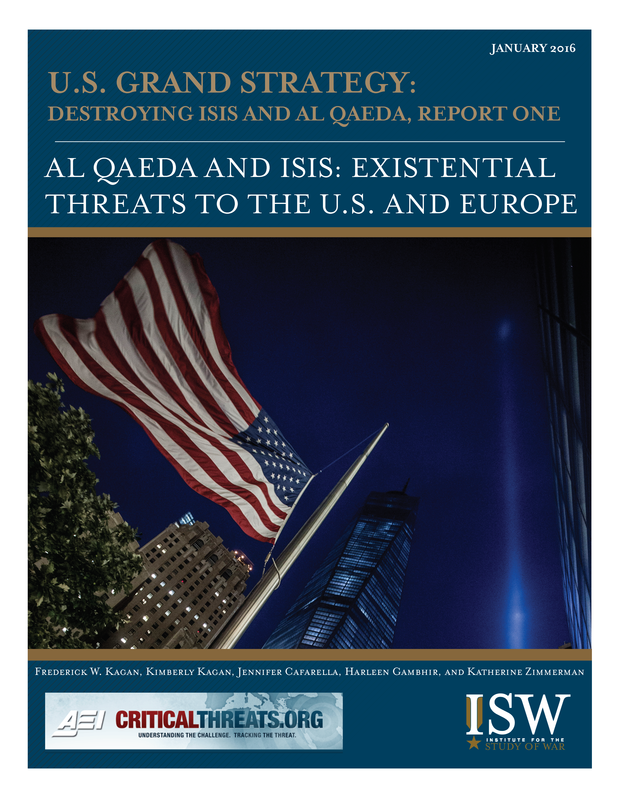 This first report examines America’s global grand strategic objectives as they relate to the threat from ISIS and al Qaeda. It considers the nature of those enemy groups in depth and in their global context. The second report will define American strategic objectives in Iraq and Syria, along with those of Iran, Russia, Turkey, and Saudi Arabia, and will articulate the minimum required conditions of military-political resolutions to conflicts in Iraq and Syria. The final report will present the planning group’s evaluation of several courses of action. Salafi-jihadi military organizations, particularly ISIS and al Qaeda, are the greatest threat to the security and values of American and European citizens. ISIS and al Qaeda pose an existential threat because they accelerate the collapse of world order, provoke domestic and global trends that endanger American values and way of life, and plan direct attacks against the U.S. and its partners. Syrian al Qaeda affiliate Jabhat al Nusra poses one of the most significant long-term threats of any Salafi-jihadi group. This al Qaeda affiliate has established an expansive network of partnerships with local oppositions groups that have grown either dependent on or fiercely loyal to the organization. Its defeat and destruction must be one of the highest priorities of any strategy to defend the United States and Europe from al Qaeda attacks. ISIS and al Qaeda are more than terrorist groups; they are insurgencies. They use terrorism as a tactic, but these organizations are insurgencies that aim first to overthrow all existing governments in the Muslim world and replace them with their own, and later, to attack the West from a position of power to spread their ideology to all of humanity. Separating the elements of ISIS and al Qaeda that are actively working to attack the West from the main bodies of those groups fighting in the Middle East, Africa, and South Asia is impossible. All al Qaeda groups and ISIS affiliates seek to take the war into the West to fulfill their grand strategic objective of establishing a global caliphate, albeit according to different timelines. Current counter-ISIS and –al Qaeda policies do not ensure the safety of the American people or the homeland. The primary objective of the U.S. government remains protecting the homeland and the American people, including safeguarding American values both in the homeland and abroad. The activities of ISIS and al Qaeda interact with the policies of Russia, Iran, and China to endanger the international systems upon which American safety and freedom depend. Any strategy to counter ISIS and al Qaeda will require coalition partners. However, there is no natural coalition of states with common goals that can readily work together to resolve this problem. The U.S. must lead its partners and ensure the continuation of existing guarantors of international security such as NATO. American and Western security requires the elimination of ISIS and al Qaeda regional bases and safe-havens. Salafi-jihadi groups independent of al Qaeda and ISIS form a base of support from which the enemy draws strength and resilience. ISIS and al Qaeda use the extensive safe haven and infrastructure of locally focused Salafi-jihadi groups to help plan, train, and equip fighters for attacks against the West. Destroying specific cells or nodes actively preparing attacks against the West is not sufficient. Al Qaeda and ISIS will be able to reconstitute the threat as long as Salafi-jihadi military organizations continue to support them.